In 2012, the Illinois Department of Commerce and Economic Development awarded Archer Daniels Midland $750,000 in grants for “emerging technological enterprises” at a facility in Decatur. In 2011, the Iowa Economic Development Board gave Cargill $2 million in loans to begin ethanol production at a refinery outside Fort Dodge. In 2010, the Louisiana Commerce and Industry Board approved a 10-year property tax exemption valued at about $32.5 million for Monsanto. For more on agribusiness and corporate welfare, also read: "Tax breaks, grants and ‘pay-to-play’ politics"
These grants, loans and tax credits are just three small drops in what critics view as a much larger corporate welfare bucket. Each year, state agencies and the federal government together send tens of billions of taxpayer dollars to some of the largest corporations in America, several of which are major agribusinesses. It is difficult to determine the exact value of the tax breaks, subsidies, grants, loans, rebates and other awards funding big agribusiness. Inconsistent reporting regulations make that nearly impossible. Publicly available data and online tools provide rough estimates, however. 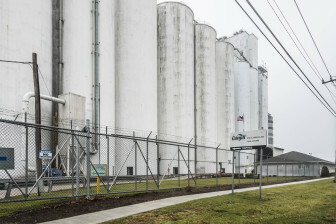 A review of Good Jobs First data on Archer Daniels Midland, Bunge, Cargill, Caterpillar, John Deere, Monsanto and Syngenta found those companies have received in excess of $596 million in financial backing from state and local agencies throughout the past few decades. 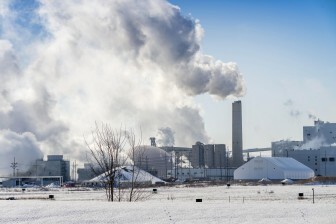 The Cargill facility in Paris, Ill., on Dec. 9, 2014. On a federal level, those seven companies have received at least $18.5 billion in backing since 2000, according to the data. Despite criticism from Sewell and others, representatives from the companies say the funds are boosting local economies by providing valuable jobs and supporting innovative research. For example, one long-term $56 million grant awarded to Monsanto is part of a $400 million investment the company is making to expand its Chesterfield Village Research Center in St. Louis. That money will help hire an additional 675 full-time employees with an average salary of $80,000, according to Tyson Pruitt, a Monsanto spokesperson. “That’s above and beyond what we already give back to our hometown each year,” Pruitt said. Jackie Anderson, a spokesperson for Archer Daniels Midland, echoed similar claims. The company has used Illinois Enterprise Zones incentives to locate and build new operations in designated parts of the state. Enterprise Zone incentives provide companies tax breaks for developing in economically depressed areas. “These operations are having positive impacts on their local economies,” Anderson said. 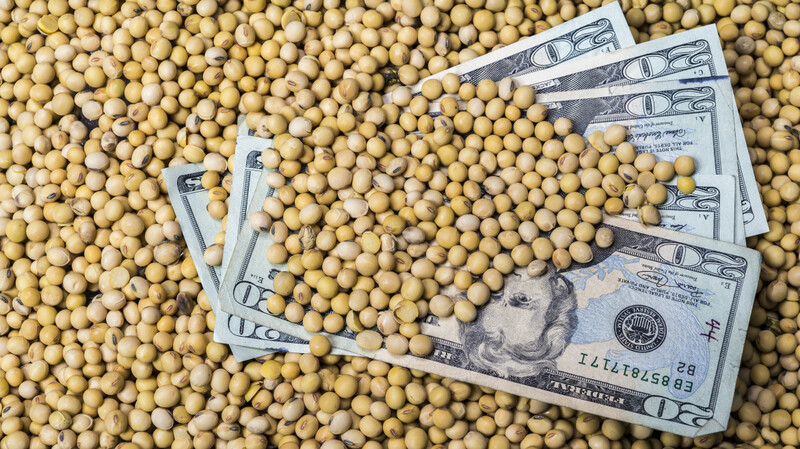 Officials from Bunge, Cargill, Caterpillar, John Deere and Syngenta declined to comment. 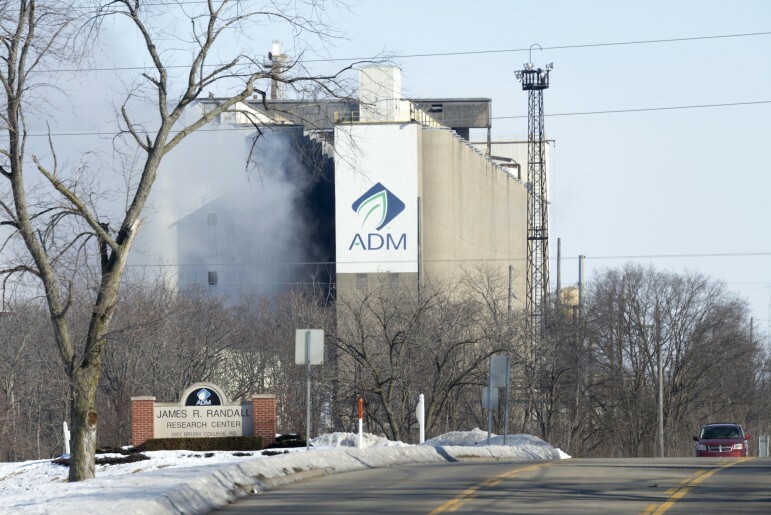 ADM facilities in Decatur, Ill., March 6, 2015. Good Jobs First data show Archer Daniels Midland has received as least $120 million from state and local agencies since 1991, in addition to at least $175 million in federal grants and at least $2.4 billion in federal loans since 2000. 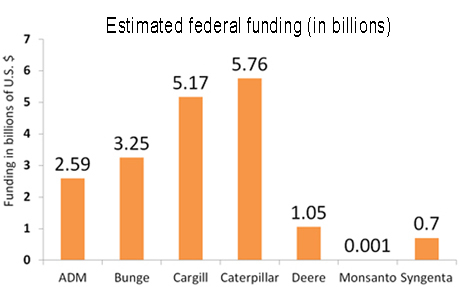 Monsanto has received at least $78 million from state and local agencies since 1998, in addition to at least $1.1 billion in federal loans since 2000. The company has received comparatively little in terms of federal grants since that time. 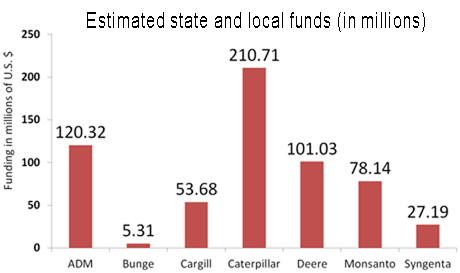 Estimated totals of state and local funding through grants, subsidies, tax breaks and loans for seven agribusinesses. Starting years vary from company to company depending on available data. For more details, visit Good Jobs First. Figures in millions of U.S. dollars. Although those totals seem large, they are mediocre compared to major technology, automotive and defense companies. Boeing, for example, has received at least $13 trillion from various state governments and local agencies across the country since 1996, according to the data. “Some of the agribusiness companies are in a middle tier,” said Philip Mattera, research director for Good Jobs First who is also part of the team that compiles the data from publically available resources and, at times, through open records requests. “The agribusiness companies are not at the very top of the list,” he said. Top companies include Intel, Alcoa and General Motors. The review of agribusiness companies found that Caterpillar has received the most in state and local subsidies out of the seven. Since 1995, it has received more than $210 million. The machinery manufacturer has received more than $5.7 billion in federal support with nearly all of that total coming through loans. While agribusiness companies continue to receive billions of dollars each year, some also hand out millions in scholarships and other awards. Monsanto’s philanthropic arm, the Monsanto Fund, routinely “invests in programs to make our communities stronger,” according to Pruitt. From 2012 to 2013, company announcements show Monsanto awarded $41 million in grants to more than 4,500 projects. “Monsanto is proud to be a part of the communities where we operate around the world,” Pruitt said. Nonetheless, Sewell said the amount of taxpayer dollars funding profitable companies should be scaled back. Additionally, local, state and federal agencies need to do a better job at evaluating the economic development that the grants, tax breaks and loans are supposed to bring, he said. Dozens of reports from the Government Accountability Office also call for more oversight. “Policymakers are responsible for determining whether incentive programs designed to inspire business development have the expected return on investment,” Anderson said.